There are few things in life that I embrace with more zeal than turning my back to the lights and noises of the city and taking to the wilderness. I have hiked the Appalachian Mountains extensively in Georgia, North Carolina, Virginia, West Virginia, Pennsylvania, Maryland, Maine, and of course Tennesse. Mostly, I stick to the Appalachian Trail, but occasionally I find myself wandering to other pathways. My favorite day-hike is a 3 mile portion of the AT that runs from Newfound Gap in the Smokies to Ice-Water Springs shelter. It's not the great views that entice me...it's the salamanders. I hike a lot with my best friend. He's learned not to follow too closely. You never know when I might abruptly stop to keep from stepping on one of my four-legged friends. 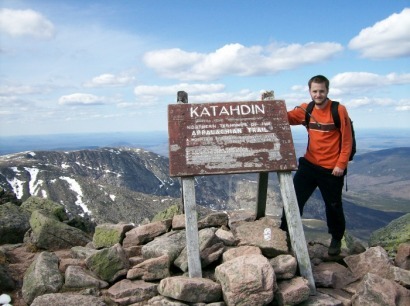 Climbing Katahdin was the fulfillment of a childhood dream. Mt. Katahdin is the northern terminus of the AT. It's in Baxter State Park, Maine; one of the most beautiful natural areas I've ever seen. As you can tell from the picture, you can't beat the view from Katahdin on a clear day.